In the aftermath of the Paris terrorist attacks, a hashtag started, #PrayforParis. Within 24 hours, I noticed something on my Facebook feed-people throughout the world were annoyed that there was a Paris hashtag! Not because they sided with Islamic terrorists or they were atheistic in their beliefs, but because people were naive to not know about the suicide bombing in Beirut. They felt that showing only support for Paris showed some heightened sense of care only for Westerners. Why do we automatically assume the worst in people? Why does this social media generation offer a blazing fire of zero grace for our fellow friends and family? I put up a picture of Paris that night, and shared my sadness towards the senseless attacks. I had not even heard about the Beirut suicide bomber, we were on vacation and the only reason I even knew of Paris was because a friend texted me asking me if I had seen the news. Nevertheless, even if I had heard of the Beirut tragedy, is it ever wrong to say you are praying for someone? Does praying for one thing always negate praying for other things? Can I relate to Paris more because I’ve been there– or does now every social media post have to come with a disclaimer at the bottom? I just finished Brené Brown’s popular book, Rising Strong. This book really challenged some of my thoughts, behavior patterns, and even made me reconsider the way I speak to my husband and my children. 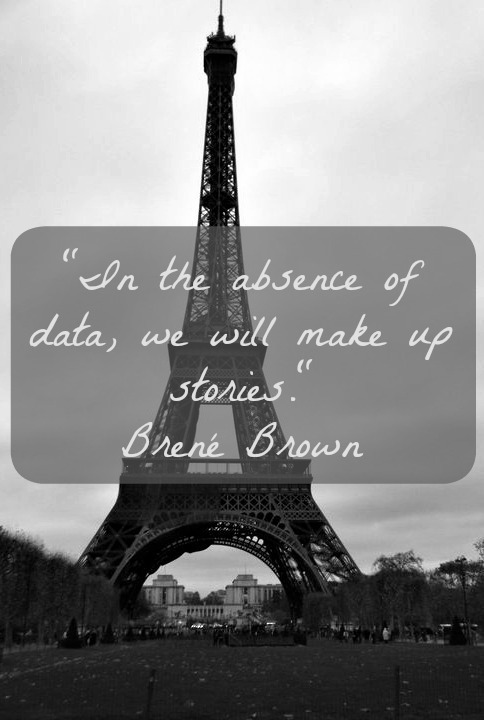 One of my favorite quotes from the book was, “In the absence of data, we will always make up stories.” We basically take an incomplete story and run with it– let our minds do the work. I am guilty as charged! We see our friend posts about Paris, but ignores the hurt going on in Mexico or Japan or Lebanon or Mali and then it hits us- They must be racist (hateful, a bigot, insert other bad words) and only care about Westerners. Now isn’t that the most absurd thing you’ve ever heard? This story was made up. Of course there is media bias and maybe even Facebook bias (some are mad there was a France filter for profile pics), but we need to give our friends the benefit of the doubt. Think of the world our kids are growing up in-it’s politically incorrect to support one cause and ideologically wrong to pray for one issue without praying for another. I can’t stand it. Just because you care about one issue doesn’t mean you don’t care about others. Should we pray for our brothers and sisters around the world? Absolutely! Should we chastise our brothers and sisters here because they “don’t care enough about the right things?” No. GRACE is always the way to live.